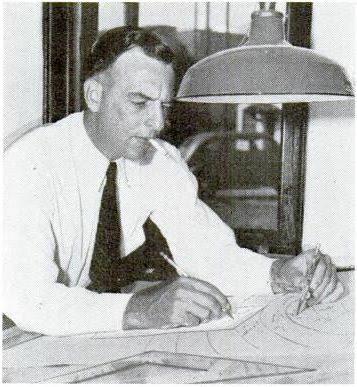 This profile of Leland Jamieson originally appeared in the October 1940 issue of Flying and Popular Aviation Magazine. His aviation stories regularly appeared in the top magazines - Adventure, Blue Book, Collier's and the Saturday Evening Post. IT’S 7: 30 p. m. by Miami’s north section clocks. A big red and green tipped airliner throbs overhead. In the shadowed nose a tall, raw-boned “big guy” of aviation and fiction streaks through the night towards Jacksonville—and new plots. It’s Oklahoma’s “word-buster,’’ Leland Jamieson, settled comfortably behind the dials and instruments of an Eastern Air Lines’ Douglas DC-3. The 21 passengers behind the cockpit door ride through the night blissfully unaware their trip may prove the basis for another stirring aviation story for the Errol Flynn-sized pilot who strode up the cabin aisle a few moments before. Don’t let Jamieson’s dual activities confuse you. For the author and pilot is a likeable, easy-going fellow who just happens to be blessed with the rare gift of fiction gab—plus a good set of reflexes which make for a good pilot. He combines both professions without any delusions of grandeur. It isn’t known if his story writing helps his flying, but readers know his flying helps his stories. Leland Jamieson has found relaxation in struggling up to the top rung of literary success. His knowledge of flying, the viewpoint of an airline and former Army pilot, all have been filtered into his writing. Leland Jamieson sits there in his writing sanctum—an office in a two-story building in downtown Coral Gables—with one leg cocked over the arm of his swivel chair. He wears a loose sport shirt, plain brown shoes and blue slack pants. 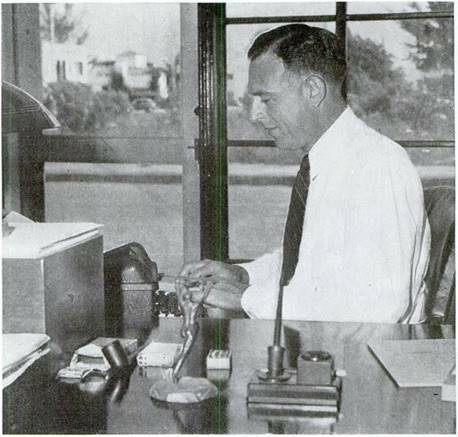 To his right at one corner of a plain office desk is an electric typewriter which he hunches up to now and then to make notes. There are no rugs on the tiled floor, no pictures on the wall—only a large map and an Eastern Air Lines calendar. He’s a bear for work this fellow who lives in a white Spanish-type mansion in Coral Gables with the pretty Mrs. Jamieson, a daughter, Sandra, and a small son, Leland, Jr. Besides flying 20 hours a week on the night run between Miami and Jacksonville for EAL, he trots down daytimes to this office to bang out more fiction. Flying five nights on the 300- mile run and laying off five nights, Jamieson doesn’t know himself how many hours he spends writing each week. He freely admits he puts in all his spare time at it and his co-pilots—those who used to fly the New York route with him—can tell you how Leland often lugged a portable typewriter along with him so he could click away at stories during layovers. His co-pilots are always trying to get back on his run because Jamieson not only is a swell cockpit pal, but he watches their progress with two eyes although they never sense it. He nearly bites his lip off time and again when a co-pilot does something wrong, but he lets the man feel the mistake out himself. He likes the co-pilot who cusses himself out after making a mistake instead of the kind that gets grimly determined and sets his mouth in a hard line of righteousness. Eastern Air Lines in 1939 awarded the amazed flier a gold medal for his extracurricular fame as the pilot who had made the most outstanding contribution to aviation during the year. Jamieson keeps it hidden in a safe and it almost takes an act of Congress to make him drag it out. “Since I was 15 I have worked more or less seriously at being a rodman on a surveyor’s gang, a mule skinner, an insurance salesman and a music store clerk; have frittered away a few years in college, managed (and mismanaged) a dance orchestra in which I played trumpet very badly, learned to fly at the Air Corps schools in San Antonio (1925) and held a second lieutenancy in the Army Air Corps on active duty for the following three years "
There is more to it than that though. A story of hard work in aviation's early days, a hectic, misdirected school career and of Army flying when America narrowly escaped losing its popular writer of air fiction. Born in Oklahoma, then Indian Territory, in 1904, Jamieson grew up in the small college town of Edmond where his father was a professor of English by day and a dairy farmer mornings and evenings. Like most sons of scholars he was no scholar, he entered Central State Teachers College and then went to Oklahoma University for a year to specialize in music. He drummed through college haphazardly, still studying music, and later organized the dance hand which brought him neither fame as an organizer nor halos as a leader. In 1923 the gangling Leland wandered around Oklahoma City airfield buying time in an OX Canuck for $15 an hour. It kept him broke. Although he had the desire to fly and walked around with his head in the clouds, he was never able to raise enough money to solo. In 1925 the Army let him in. He obtained an appointment to Brooks Field, San Antonio, Texas, and was "set for life.” He was no blazing comet across the Army Air Corps skies. But he acquired the flying knowledge that today strongly marks his fiction and his commercial air route piloting. He was commissioned a second lieutenant in 1926 and was sent to Kelly Field to instruct with only a few hundred hours under his belt. Jamieson stayed at Kelly Field until 1929, using his spare time on the ground for writing air stories which had a habit of coining back to him more often than they stayed put. "After about two years of selling sparetime fiction to the pulps, I had had enough of the Army—due in part to my belief that I could make a living writing, but mainly to an undiagnosed case of carbon monoxide poisoning from the open exhaust stacks of the Army planes I was flying several hours each day. I was sick most of the time and light-headed and faint every time I stayed more than an hour or two in the air. Every doctor I went to told me nothing was wrong with me, but I knew there was; and I knew that sooner or later I was going to pass out in the air. "So I resigned and for a few weeks did nothing but write. The mysterious illness left me completely and the itch to fly returned. Finally I abandoned the full time fiction job to manage a system of flying schools and I began flying again somewhat skeptically. But in commercial planes with their exhaust collector rings that piped the exhaust gases away from the cockpit I never felt ill again.” Today Jamieson has over 10, 400 hours! To get at the base of one of Jamieson’s fundamental precepts—that you must prepare yourself for what you want to do— it is necessary to go back to the bonanza period during 1929 when, as he himself puts it, he was “tossed into the madhouse of commercial aviation.” He had been out of the Army a few weeks and was making a living from his stories when the telegram from Interstate Airlines came offering him a job as manager of a system of flying schools. Jamieson jumped at it. "They said,” he explains ruefully,” that I would have time to write at least a story a month and do their job too. But in the next two years I wrote only one story.” So the writing of fiction was for those two years a lost hobby. He is, he says, still fumbling around. He fumbled through some 60 or 70 published pulp magazine yarns—then, after 10 years of literary sweating, cracked America’s largest weekly with an action-packed air rescue story about the Louisville flood. The editors asked for more. They came in frequent succession. The same Kelly Field writing zeal was there, but the success sand glass had been tipped the other way and soon Jamieson was making a name for himself as a writer. In 1933 the Jamieson clan was saddened by the death of Leland’s brother, William Lawrence, killed in a plane crash on an airline route. As a pilot Lawrence had no equal, both Leland and his younger brother, Warren, now a captain on the New York- Miami run, agree. “Lawrence was my pilot in ‘High Frontier’,” says Jamieson. “He could fly rings around Warren and myself. He was one great guy and the nearest to perfection any flier will ever come.” You will probably find Lawrence in many of Leland’s stories. Possessor of only one hobby—photography, which he plies at home in a darkroom where he can mix around in developer and hypo to his heart’s content—Jamieson does all his fiction writing at his downtown business office. A careful writer, making sure he is right in every phase before he sets it down in type, he has no other formula for writing his stuff other than “trying to tell a story.” If he's writing a naval aircraft carrier story like “Attack,” which appeared in the Post in June, he writes dozens of letters to experts to gather technical information for an accurate background for his story and for a check against his finished manuscript. He has sold about 10 short stories to the Post plus two serials,” Attack” and “High Frontier,” both of which have been optioned by Hollywood for motion picture production and scheduled for book form. Right now he’s down there in his office banging away at war and airline and aviation short stories with the Post urging a new war serial for this winter. Yes, he sleeps and eats regularly. His wife insists upon that. For his serial Attack! in the Saturday Evening Post, Jamieson talked to Naval officers, studied tactics, then went to work to plot accurate action on map. According to Black Dog Books Leland Jamieson died the next year of pancreatic cancer. He was only 37. Yes, he died on July 9, 1941. less than a year after this article was published. It's sad that he didn't live to enjoy his success. I read a bunch of Jamieson's stories in BLUE BOOK and enjoyed them a lot. Fine writer. Thanks for this post. I liked his stories in Blue Book, too. I'll post a review of them some day or review an issue of Blue Book that has a story by him.